A refrain I hear often is that Scrum events are a passle of useless meetings that constantly go over their timeboxes and take valuable time away from the actual work of developing software. It’s a bit like saying, a hammer is terrible for driving in screws and only ends up smashing your fingers. A hammer is designed to drive nails. Scrum events are designed to exert a specific and focusing pressure on the goal of the time. In his book Death by Meeting Lencioni explains how different types of meetings have different uses. 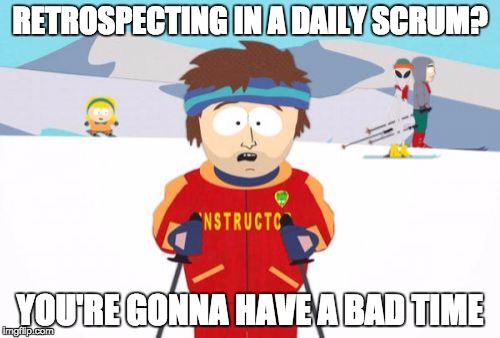 Trying to force a daily check-in to take the place of a weekly tactical or a monthly strategic to take the place of a quarterly off-site review is like using a hammer to drive in a screw. Don’t get me started on the meeting stew where all four are slow simmered into the counter productive, life-sucking slop we all know and loathe. Each event in Scrum has a carefully designed purpose, like a tool. Each is a precisely honed feedback loop designed to have a particular effect. 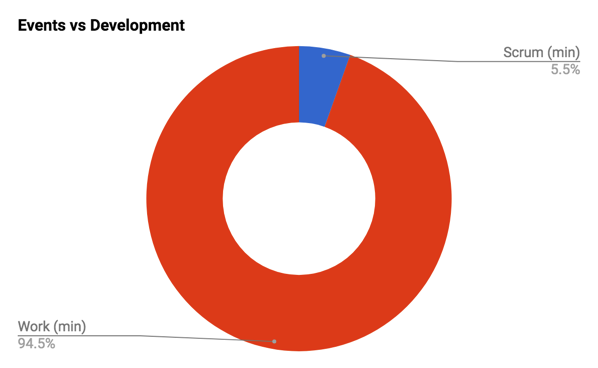 That huge chunk of work time is the minimum amount of time Scrum sets aside for designing, testing, coding, delivering etc. or in other words developing software. These numbers are based on a 30 day Sprint (counting 5, 8-hour work days per week for 4 weeks). They also assume the maximum timeboxes for each Scrum event. From these it’s clear Scrum intends to take the as little time away from the work of producing working software as possible. 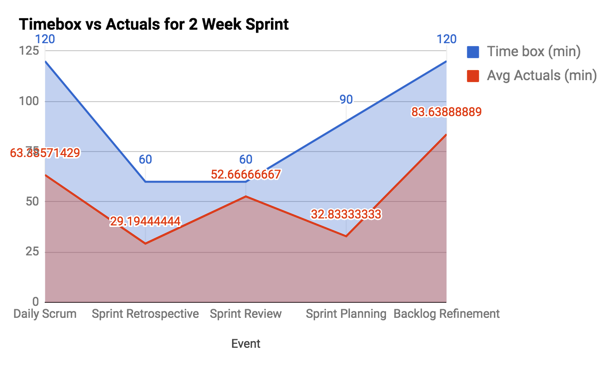 Important note: backlog refinement isn’t one of the Scrum events, but we decided to track that time as well. We’ve been able to squeeze the value out of each Scrum event without consuming the whole timebox…for every event. We can turn on a dime when most requirements or technology realities change, we quickly identify and solve many daily issues that would sink silo’ed teams, and we set aside time to have the hard conversations necessary to improve how we work. To be sure, we have administrative time costs, time lost at the coffee machine or around the ping pong table. We have thoughtless meetings here and there that sap our will to live. We waste time in new and creative ways occasionally, but Scrum don’t care about that. 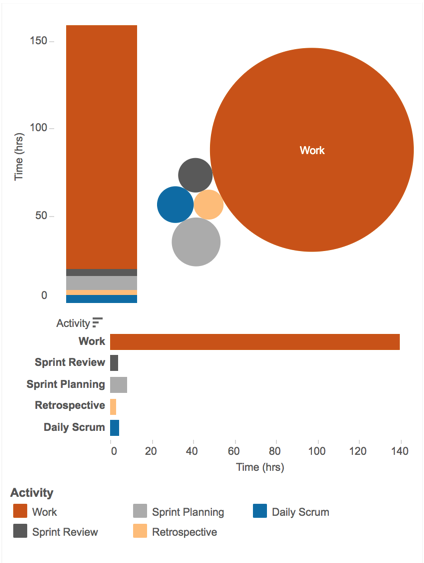 Moreover, we can’t honestly blame Scrum for that waste. Scrum calls us forth to operate as professionals in full command of our work time and with clear insight into the system around us. Not everyone will become as effective at practicing the Scrum events as we have become. It wasn’t instant. It took hard work over several years to get to our current level of dysfunction :). If you’re faithful to study the purpose and perfect the execution of each event, you’ll get there too.